Our guest house lies within 15 min. walking distance from the airfield and offers room for ten people (3 double and 4 single rooms). 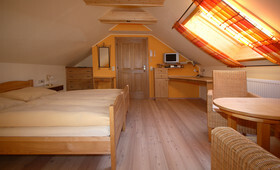 All our rooms are tastefully furnished in solid wood, and have SAT-TV and internet access. 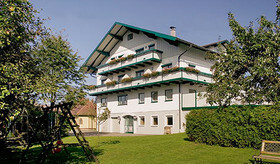 Small family hotel with a cozy inn just 15 minutes from the airport. Offers you rooms and suites from natural wood furniture with shower/WC, hairdryer, flat screen TV, free Wi-Fi and a balcony with stunning view of the countryside! 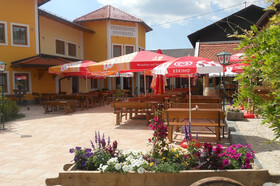 Cosy restaurant with regional menu, daily full breakfast buffet, new yard garden with a traditional bar. Spacious garden with swimming pool (May to October), garden pavilion, petting zoo. Our house offers the seminar hotel, with 4 conference rooms and a total of 31 guest rooms, most are furnished with Team 7 furniture, a cozy dining room with an adjoining room, a small bar and two bowling alleys. Our cuisine is regionally focused, we are happy to also prepare different menus and wholesome dishes.